White is synonymous with peace, tranquility, and simplicity in the human psyche. It blends with and complements all colors, making them appear brighter than they would on their own. 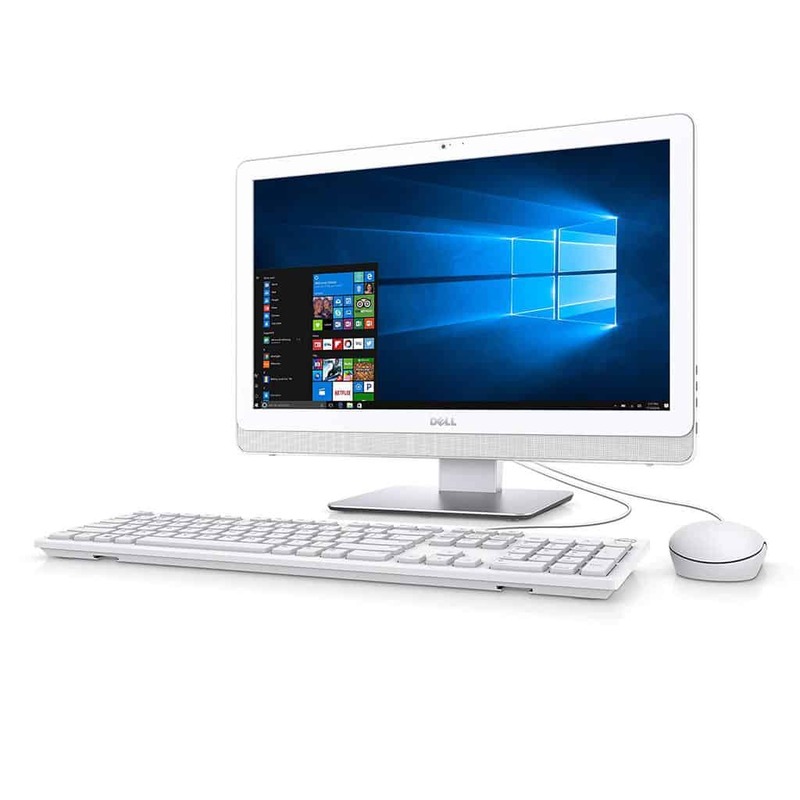 The Dell Inspiron i3265-A643WHT-PUS | Amazon is an all-in-one desktop computer adorned with a white exterior that spells out simplicity and mild style. Its designers envisioned a simple, budget-friendly machine that would fit the most cramped of spaces – and they achieved what they desired. This all in one desktop stems from Dell’s lineup of AIOs named Dell Inspiron 22 3265. 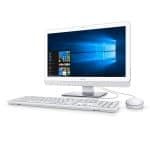 The Dell Inspiron i3265-A643WHT-PUS makes an excellent home or office AIO desktop device that promises dependable delivery on multimedia / light office tasks. Simple yet elegant, that’s how we see the Dell Inspiron i3265-A643WHT-PUS. Its beauty lies in nothing more than its simplicity. Around the beautiful LCD display is a thick bezel that goes all-round the machine…not as awe-inspiring as borderless design displays we see coming out today. But as it is for most users, functionality is key…and if it ain’t broke, there’s no point fixing it. The size of the hinge wouldn’t bother them even the slightest bit. Its metallic stand has a silver luster to it that catches the eye, thanks to the all-white surrounding. The stand offers the user in excess of 20 degrees of tilt freedom but lacks pliability in regards to pivot and swivel movements. However, coming to its rescue, it wasn’t meant to pull such stunts anyhow. Its best application would be the bedroom or living room table or at the office desk, where such theatrics may likely be unnecessary. And since its a budget machine, installing such a stand would only serve to bump the price higher. The Dell Inspiron i3265-A643WHT-PUS features a neat set of ports located at the rear end of the machine and at the left-hand side from the user. The OSD keys, on the other hand, are located on the right side of the display from the user. The upper bezel host a HD camera while the bottom, two in-built stereo speakers. Also included is a DVD reader/writer on the upper right-hand side of the display, which is a most welcome feature in any desktop computer. While we applaud Dell for their design, we do not like the choice of peripheral devices they made. Buying an AIO machine for most people is in a bid to eliminate the clutter from their desks. The Dell Inspiron i3265 would excel in this were a wireless keyboard and mouse use. To our estimate, the keyboard and mouse felt a little cheap, and not entirely to our taste. However, they are functional and will offer excellent service until one deems it fit to replace them. Adorning the Dell Inspiron i3265-A643WHT-PUS is a 21.5-inch LED-backlit display with a 1920 x 1080 pixel resolution. LED displays don’t excel in dark images and shadow, a factor that’s not entirely noticeable unless someone brings it to your attention. Viewing angles are wide – which comes handy when consulting a colleague at work or when watching a movie with friends at home. Thanks to the anti-glare display, long working hours are far more bearable with glare out of the picture. Pdf documents will no longer torture to your eyes thanks to this feature. The Dell Inspiron i3265-A643WHT-PUS comes with a fair port selection sufficient for most user’s needs. At the rear end are two USB 2.0 ports for connecting low power peripherals, an RJ-45 Ethernet port, an HDMI port, audio line out and DC power port. On the side are two USB 3.0 ports, an SD card slot, and a 3.5mm headset jack. The Dell Inspiron i3265-A643WHT-PUS is powered by the APU A6-7310 quad-core processor, which is paired with a Radeon R4 Graphics and 6 GB of DDR3L RAM. The APU A6-7310 is an entry-level processor based on the 28nm, Puma+ microarchitecture and has a clock speed of 2.0GHz. It can turbo frequency of 2.4 GHz and has a TDP of 17 Watts. That means that it can handle word processing, browsing with multiple tabs open, streaming digital content among other tasks without breaking a sweat. However, it not powered enough to handle extreme multitasking, such as when browsing the net with multiple tabs open while streaming movies and having other programs running in the background. But if that’s not what you expect from it, then you are safe. The graphics unit is equally basic, sufficient for good video rendering among other basic tasks. Gaming is not among its strongest points, but it will handle a light title such a Pro Evolution soccer at minimum settings. With 6 GB of RAM, we assume that most users will be content. For gaming, we recommend either a gaming desktop or an AIO gaming desktop. However, it is possible to upgrade to a maximum of 16 GB. With a screwdriver at hand, it’s an easy task to swap the present RAM with a higher volume or even replace the Hard disk with a 2.5″ SATA solid state drive. Finally, the Dell Inspiron i3265-A643WHT-PUS comes with a 1 TB hard disk drive, which is plenty of real estate for storing your music, videos, and work files. Among the things that appeal most about the Dell Inspiron i3265-A643WHT-PUS is first and best of all its design. Its white chassis makes it an easy task blending into any environment, whether at work or home, which is an obvious plus. However, a better choice of a mouse and keyboard would have gone a long way to elevate the positive impression already made. It further features an excellent port system, although the wired mouse and keyboard occupy two of the USB ports straight from the box. This, however, needs not to be a deal breaker since the two can easily be replaced with their wireless alternatives. Other features that make the Dell Inspiron i3265-A643WHT-PUS an excellent machine for the home or office include its Full-HD display with a matte finish, loud internal speakers and dependable performance. Weighed on a fair scale, the Dell Inspiron i3265-A643WHT-PUS makes an excellent machine for anyone who’s in the market for a small size AIO machine on a budget.